I read an interesting article, “Good With Faces” by Tibbetts and Dyer, in the December 2013 issue of “Scientific American”. One traditional theory states that the large brain of humans evolved in order to be able to interact and function with other humans in complex social relationships. Humans have a specific area of the brain, the fusiform face region, dedicated to recognizing faces in a “holistic” manner – if an area of a particular face is altered or the orientation changed (turned upside down) it is difficult to recognize the face. 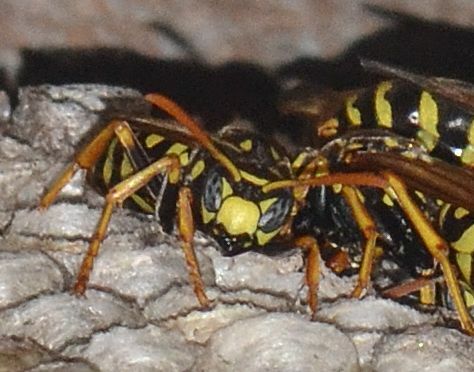 The researchers noted that the coloration and arrangement of the spots and stripes making up the faces of a species of paper wasp, Polistes fuscatus, differed between individuals. Were the wasps able to differentiate between individual nest mates? Without my going into all the experimental details, the authors discovered that, like humans, P. fuscatus perceived faces as a whole. The wasps could differentiate between normal wasp faces. However, it was much more difficult for the wasps to differentiate between altered faces (for example, if an antennae was removed). Here is an insect with a brain 0.01 the size of a human brain that recognizes faces in the same manner as humans. Polistes fuscatus nests have groups of queens that work together. It behooves members of the colony to be able to distinguish the different queens and their social ranking. Another paper wasp, Polistes metricus, does not have distinctive facial markings and has only one queen per nest. It is much less important for P. metricus to be able to recognize individual faces with only one queen. Indeed, Tibbetts and Dyer found that P. metricus wasps do not have a holistic facial recognition ability but rather approach faces as a collection of individual characteristics. Fascinating! The article also describes the authors’ work on honeybee facial recognition and speculates on the evolutionary implications of their research. The authors also suggest that their work might have some applications in the development of face-recognition software. The pictured wasp face is that of a European paper wasp, Polistes dominula, living under an eave of our bunkhouse. It belongs to the same genus as the research wasps. It will have to suffice since I do not have pictures of the subject wasps and have a personal “rule” to only use my own photographs in this blog. This entry was posted in Insects and tagged European paper wasp, facial recognition, nature photography, paper wasps, Polistes dominula, Polistes fuscatus, Polistes metricus. Bookmark the permalink.